Washington DC’s Walter E. Washington Convention Center opened in 2003 but not until November 2011 was ground broken on a 1,167-room Marriott Marquis across the street. Fans have long considered such a hotel the essential missing piece in any plan to return the Worldcon to Washington. Two Worldcons have been held in Washington DC (1963, 1974). Two more bid committees tried to bring the convention back. An out-of-rotation bid for 1984 depended on a rules change that failed to pass. A bid for 1992 was forced to fold a few months before the vote after losing its first option on the Sheraton Washington. But remember – when it rains, it pours. The Washington Post ran an article last September reporting that developers would like to build two more Marriotts beside the one already going up by the convention center. However, the city has balked on giving them $35 million in subsidies they want for the project. Posted in 70s Fanhistory, 80s Fanhistory, 90s Fanhistory, Worldcon	| Tagged Michael Nelson, Washington D.C.
Francis Hamit will speak to the Civil Warriors Civil War Round Table of the West San Fernando Valley on Wednesday, February 8. His topic will be “Behind The Queen of Washington,” Hamit’s second novel drawn from the work of the Confederate Secret Service and the women who were its most effective agents. Rose Greenhow is the protagonist of the new novel, while its predecessor, The Shenandoah Spy, was based on the adventures of Belle Boyd. Hamit spoke to the Civil Warriors in September 2008 about Belle’s story. The Round Table meets at Weiler’s Deli and Restaurant in Canoga Park. Hamit will speak at 7 p.m., preceded by an optional dinner and drinks. See the website for cost and RSVP. I spent a couple minutes entranced by this goofy, paradoxical image. How funny is that! But it’s not a hack. 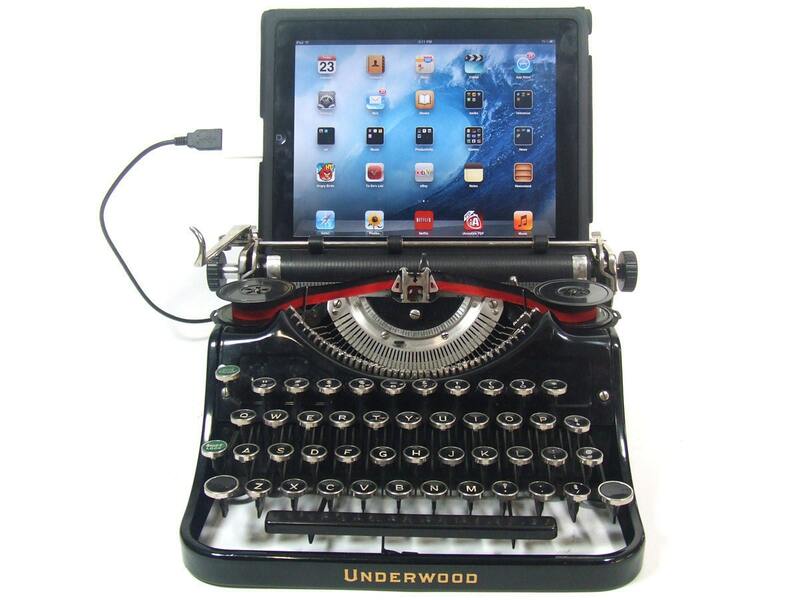 There really is such a thing as a USBTypewriter. In fact, if you’re handy with a soldering iron you can buy a Do-it-yourself kit for $74 and upgrade that beloved manual typewriter now sitting in your closet. Or simply buy a finished product in the inventor’s etsy store, fully assembled, tested and ready to go. Those are priced around $800. I always use an Olympia manual typewriter, either an office model or a portable. That’s all I use. Book face type. I do not use an electric because I type too fast. The ball can’t keep up with me. I use two fingers, 120 words a minute, no mistakes. I can’t use a computer. Despise it. It’s like another entity trying to get in my head and interfering and bothering me. Never mind, I still think the whole idea is a hoot. C.S. Lewis is among the many who rejected royal honors named in a disclosure [PDF file] made under a freedom of information ruling. Lewis declined a CBE he was to have been awarded in the New Year’s list of 1952. The disclosure only lists names, it does not reveal the reasons for anyone’s refusal, reports the BBC. This has misled some commenters to assume the reason for Lewis’ refusal is unknown. Far from it. By 1952 Lewis had enjoyed a substantial scholarly and literary career, and achieved fame as a speaker and Christian apologist. His most recent work at that time included the first two Narnia books, The Lion, the Witch and The Wardrobe (1950) and Prince Caspian (1951). Mere Christianity would be published in 1952, subsequent to the New Year’s list. The Amazing Stories Project has published a review of Daniel M. Kimmel’s collection of SF film essays Jar Jar Binks Must Die (Fantastic Books). Steve Davidson says they’re giving away a signed copy of the book, provided by Fantastic Books, “to the first commenter who can name the title of a 1950s SF film that is not covered in the book and that does not have the letter ‘I’ in the title.” More details on the book giveaway contest here. (1) Hard to believe fandom didn’t invent this award first. A new literary prize aims to reward book reviews with edge. The Hatchet Job of the Year Award honours “the angriest, funniest, most trenchant” review published in a newspaper or magazine in 2011. I’ll always be grateful that I got to meet Muhammad Ali when he was still in the full height of all his many powers. 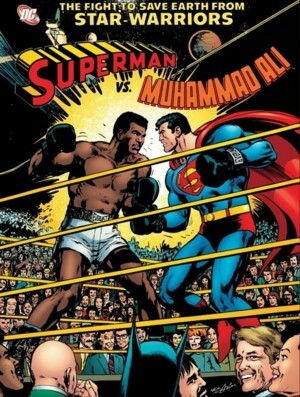 The occasion was an odd one–a 1978 press party at the Warner Communications building on Fifth Avenue, heralding Superman Vs Muhammad Ali, a special edition “deluxe” comic book volume that DC Comics produced (in which aliens compel the two titans to tussle, “to save the Earth”)..
Of course the 21st century has been the one in which Irish comics and creators seem to have come into their own, and when I walked into Forbidden Planet in Dublin just before Christmas and saw a whole wall, separate and in prime position, dedicated to home grown comics, I was impressed. It was about 24 linear feet, all facing forward and just looking awesome. There were over fifty titles, from stunning looking graphic novels to neat and tidy A5 photocopied comics. Although these comics are indigenous, it seems the likes of Atomic Diner, O’Brien Press, and Muccu Press are all professional when it comes to their products. (4) Wired magazine reports on the new NASA chamber designed to mimic conditions on the surface of Venus. They’ve needed it ever since satellites discovered the planet isn’t anything like the one in Bradbury’s stories, whose conditions can be mimicked quite inexpensively in a Turkish bath. (5) You should track down an article by Jennifer Schuessler called “Who Word-Processed First?” that appeared in the Arts Beat blog of the January 10 New York Times. It’s about a scholar who is trying to find out who first used a computer to write fiction or poetry. The answer is: Jerry Pournelle. In a recent blog post the science fiction writer Jerry Pournelle criticized Mr. Kirschenbaum for failing to award him bragging rights as the first to complete a science fiction novel — and perhaps any kind of novel — on a computer. Not only did he begin writing fiction on a souped-up Z-80 PC named Zeke in the late 1970s, Mr. Pournelle noted, but his old computer is also currently in the collection of the Smithsonian, albeit in storage. Another example of something that was once widely known being forgotten. Fortunately, in this case, the person who made the history is still around. (6) How’s this for a musical challenge – composers were called upon to create a soundtrack for rediscovered colour print of Méliès’s 1902 Le voyage dans la lune. But I wonder if problematic uses of drone technology by private individuals might eventually be answered with something like Niven’s cop’s-eyes from Cloak of Anarchy”? (8) Patrick Rothfuss boosts his novel’s editor for a Hugo in a delightful example of that “less icky” self-promotion Mary Robinette Kowal was touting the other day. Although the full post is riddled with verbiage I am more likely to use while driving the I-210 than on a blog, it punctuates the kind of self-deprecating humor Rothfuss writes here to persuasive effect. Some of his work from that period I would match against almost anybody’s best stories ever, including “The Marching Morons,” “Two Dooms” and a good many others. (The intelligent folks at NESFA have put all those stories in a single volume, entitled His Share of Glory: The Complete Short Science Fiction of C.M. Kornbluth.) None of them won any Hugos or Nebulae. The reason was just some of Cyril’s bad luck. The awards hadn’t been invented yet. (10) Homer Eon Flint coulda been a contender. (11) Thanks to the people who saved copies of old TV shows devoted to the science fiction field until the day when they could be uploaded to YouTube. Here is a digitized episode of James Day’s public TV series Day at Night from the 1970s where Ray Bradbury is interviewed. Dr. Howard Falcon-Lang, a paleontologist at Royal Holloway, University of London, said Tuesday that he stumbled upon the glass slides containing the fossils in an old wooden cabinet that had been shoved in a “gloomy corner” of the massive, drafty British Geological Survey…. (13) Evelyn Leeper recently finished and posted her full Anticipation (Worldcon 2009) convention report with panel descriptions. (14) San Diego’s own Qualcomm has created a new X Prize. The company is putting up $10 million for a competition for teams to create a media scanning device inspired by Star Trek’s tricorder. The final device will be judged on its ability to diagnose a series of 15 diseases as well as its usability. (16) When clay is outlawed, only outlaws will have clay. Does Gumby have an alibi? The tablet computers, like most Apple products, are known for their sleek and simple designs. But there’s no mistaking the iPad for one of the world’s oldest “tablet devices.” Still, most electronic products cannot be returned to stores. For the the stores and customers to be fooled by the clay replacements, the thieves must have successfully weighed out the clay portions and resealed the original Apple packaging. Future Shop spokesman Elliott Chun told CTV that individuals bought the iPads with cash, replaced them with the model clay, then returned the packages to the stores. The returned fakes were restocked on the shelve and sold to new, unwitting customers. (17) On the other hand, this well-intended law is a lot harder to violate. Two US states seeking to preserve Moon exploration history have added key artifacts to their registries of historic items. California’s catalog of historic artifacts includes two pairs of boots, an American flag, empty food bags, a pair of tongs and more than a hundred other items left behind at a place called Tranquillity Base. The history registry for New Mexico lists the same items. That might be surprising, since Tranquillity Base is not in New Mexico or California but a quarter of a million miles away, in the spot where Neil A. Armstrong and Buzz Aldrin stepped onto the moon in 1969. But for archaeologists and historians worried that the next generation of people visiting the moon might carelessly obliterate the site of one of humanity’s greatest accomplishments, these designations were important first steps toward raising awareness of the need to protect off-world artifacts. …It turned out to be a tricky question. Under international law, the United States government still owns everything it left on the moon: the bottom half of the first lunar lander, the scientific experiments, the urine bags. But 100 nations, including the United States, have signed the Outer Space Treaty, in which they agree not to claim sovereignty over any part of the moon. (18) Scientists may soon know whether Renaissance artist Georgio Vasari preserved a long-lost work of Leonardo Da Vinci, “The Battle of Anghiari,” behind his own when he was commissioned to cover that space. …Given several nights to complete the work, the team scrambled to find fiber-optic cameras and a rig that would allow them to drill safely. High up on a scaffold, Italian conservators carefully lifted off 1-inch squares of the fresco and with a 6-millimeter bit bored six holes through the brick wall Vasari had built. In each hole, Seracini’s team inserted a 4-millimeter endoscope and watched breathlessly on a nearby monitor. For now, the results of those probes are being guarded jealously by Seracini’s team. They are likely to hinge not on dramatic images but on an analysis of whether samples taken from the wall contain pigments or resins known to have been used by Leonardo. The incoming Morse then got more personal, mocking Marconi: “There was a young fellow of Italy, who diddled the public quite prettily,” it trilled. Further rude epithets – apposite lines from Shakespeare – followed. The stream of invective ceased moments before Marconi’s signals from Poldhu arrived. The demo continued, but the damage was done: if somebody could intrude on the wireless frequency in such a way, it was clearly nowhere near as secure as Marconi claimed. And it was likely that they could eavesdrop on supposedly private messages too. Nevil Maskelyne, a British music hall magician, claimed the hack in a letter to the newspapers. …Maskelyne came from an inventive family – his father came up with the coin-activated “spend-a-penny” locks in pay toilets. Maskelyne, however, was more interested in wireless technology, so taught himself the principles. Have you ever had writer’s block? Oh, I absolutely have. Really? When? From four until about five o’clock on a Wednesday in January of 1973. How did you cure it? I went to sleep. Went and got laid. Went and had a Pink’s hot dog. Came back, sat down, finished writing. What’s sad about writer’s block is that you forget what you were going to write about. Sometimes I’ll look at a story and say to myself, “Oh, I’ve got a perfect ending” and then make the mistake of forgetting it. It only happened to me twice with stories I had to finish because I was on deadline. I’ve looked at those stories since and wanted to do them over because I knew I had a better ending. The endings are perfectly fine and nobody notices, but I know the difference between good and bad. Winokur’s own long list of credits includes his collaboration with James Garner on the actor’s memoir, The Garner Files. I read that last year and wholeheartedly recommend it.